Founded in 1893 by Louis Bamberger as L. Bamberger & Company in Newark, New Jersey, in 1912 the company built its landmark flagship store designed by Jarvis Hunt at 131 Market Street (Hunt would also design the Newark Museum following a gift from Bamberger). 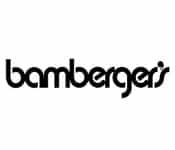 In 1929, Bamberger’s was purchased by R.H. Macy Co. The famous Macy’s Thanksgiving Day Parade was originated in Newark by Bamberger’s.